Anywat, the Malanthrope and Carnifex have come on leaps and bounds as I'd hoped to use them in my game tomorrow. They aren't finished but they may be enough for them to not look unpainted. Deathleaper has been put on hold so I could progrees further with these two and also because the freehand banner is a bit of a challendge and I don't really need him until Blog Wars. 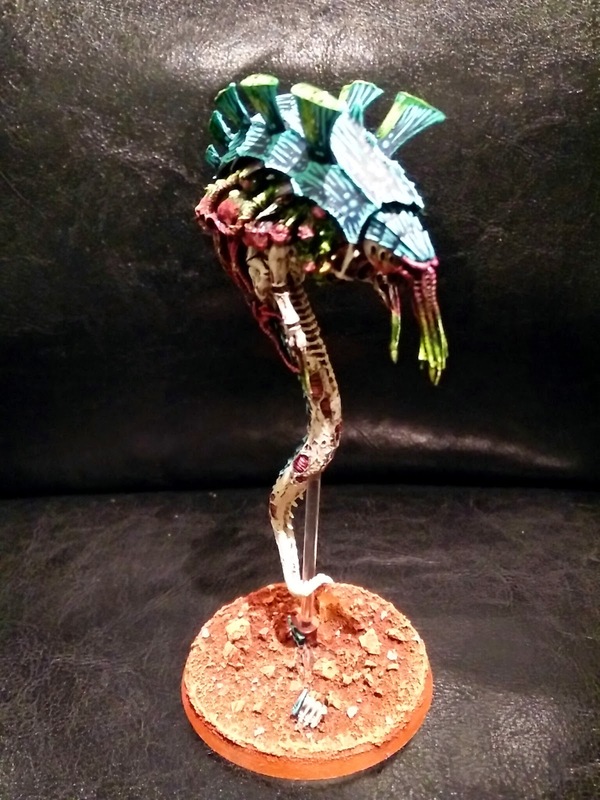 All the usual Hive Fleet Gorgon effects are in place here, although I started doing all the green and red bits before I've done the second set of bone highlights. That may come back to haunt me but we'll see. I have actually got to the point with the tendrils and sacs that there is just so much detail I actually don't care. There's going to be Tamiya Clear Red X-27 going on too so any highlights I do will be covered in places and as it will have a gloss varnish there will be areas of reflection that will obscure it as well. I just want him done and although it won't be perfect I'm happy with the result. Possibly need some more glow effect highlights on the vents. Thanks NafNaf still a bit to do but he's getting there. Really nice paintjob Dave. I hope to see your nids in person someday. They look so great! Love this model, and purchased one years ago. Very happy he has decent rules no too! Your paintjob continues to impress. It'll be interesting to use, it's certainly more interesting than my Venomthrope although all these big creatures are stating to skew my scale of 40k models, normal 25mm based minis look, erm mini! Looks fine to me but then I love the model and would still love it even if it was just undercoated. You seem to be using more green but that's entirely appropriate for a highly poisonous feeder beast. Yeah, the green is cropping up a bit more - it's either toxic or bio-plasmaheat generations. I was going to do some on the Carnifex vents but decided not to because it was becoming a bit much, afterall the base is pretty violent green already! Awesome paint job Dave really like your style.